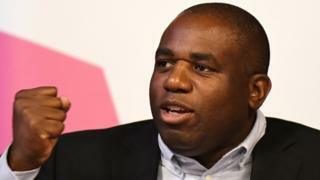 The Labour MP David Lammy has said he will not be scared into silence after receiving a highly offensive letter.The MP for Tottenham shared an image of the racist note on social media, calling the anonymous sender "cowardly". In a follow-up tweet Mr Lammy said he had passed the note to the police in a "depressingly familiar routine". Thousands have commented on Mr Lammy's tweets to share their support. Labour MP Stella Creasy responded to Mr Lammy's tweet with "love and solidarity". Rosie Duffield, Labour MP for Canterbury, replied to Mr Lammy's post to say that "these ignorant cowards don't represent the majority of decent UK citizens".Many people tweeted to condemn the abusive letter, variously calling it "despicable", "disgracful" and "disgusting". After the 2017 general election, Conservative and Labour MPs detailed how they have regularly faced racist abuse, anti-Semitism and death threats on social media. Conservative MP David Davis recently told the BBC that abuse of politicians is "definitely getting worse". Clare Jordan wrote that those sending abusive letters to MPs "ought to hang their heads in shame". A spokesman for Mr Lammy told the BBC: "David regularly receives abusive and malicious communications, often of a racist nature. "All such letters are passed onto the police. As David has made clear, receiving racist abuse will not have any impact on his work." This is not the first time Mr Lammy has used social media to highlight the racist abuse sent to him. In April, the Labour MP posted an image of a letter he received after he criticised the government's handling of the deportation of Windrush migrants. The offensive note told Mr Lammy to "be grateful that we have taken you in as a black man" and suggested he "go back to your country".Mr Lammy pointed out that he was born in Whittington Hospital in north London.